THE SIMPSONS and KING OF THE HILL, comes an irreverent new, adult comedy series about what the biggest, most outrageous WWE Superstars® were like as kids. 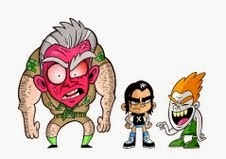 CAMP WWE follows these unruly tykes as they body slam their way through their formative years. Proving to be a nightmare for teachers and other kids, their exhausted parents pack-up their future WWE Superstars with their masks, chains, kneepads and security blankets and send them off to Camp WWE, to be transformed into model citizens by the most terrifying counselor who ever lived, Mr. McMahon.